The panels between floors have been covered with a stucco-like material, apparently in an effort to modernize the appearance. Edward E. Ashley was a one-man show as the turn of the last century approached. A trained architect, he was also a builder and acted as his own real estate operator as well. Although he most often constructed apartment buildings, on March 6, 1897 the Real Estate Record & Guide reported that he had filed plans for a 25-foot wide "brick and store store and lofts" building. The six-story structure would cost $20,000 to erect; about $597,000 today. Completed the following year, Ashley's loft building rejected showy ornamentation in favor of two three-story fluted pilasters at the mid-section, handsome Renaissance Revival panels at the top floor, and a neo-Classical frieze of swags below the cornice. The two-story cast iron storefront wore an egg-and-dart lined frame with button-like bosses. The building became home to the J. T. Huner Co., operated by John T. Huner. A jobber, he represented match manufacturers, like the Modern Match Company and Improved Match Company, both based in Detroit. Not long after moving into the Hudson Street building, Huner found himself up against a formidable adversary--the massive Diamond Match Company. With regret must we inform you that the Diamond Match Company have informed us that if any other matches but their own were handled by us they would cut us off on their goods. You can readily see that in the position in which we are placed it will be impossible for us to do any business with you at present. Enraged, Huner went to the press. A New York Times journalist investigated and found Diamond Match Company coolly unapologetic. "Frank B. Clagget, manager of the Diamond Match Company, frankly admitted that the letter in question had been sent to Von Glahn Brothers. He said there was nothing unusual about it," reported the newspaper on October 26. It was the first shot in a battle John Huner would fight for years. But attention briefly turned to a horrifying accident on October 4, 1900. John Anderson worked as a traveling salesman for Huner. 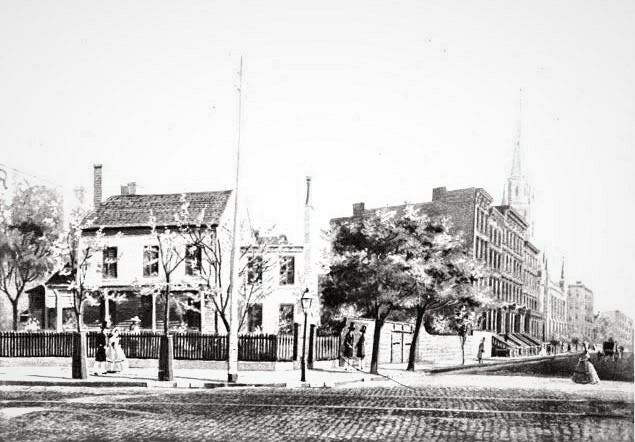 The 18-year old lived in a boarding house on tiny James Street near the East River. On warm evenings he often went to the roof, where he would sit on "a stone on the edge of the wall," as explained by The Times the following day. Anderson was not the only boarder in the habit of taking the night air on the roof. Another came up to join him that night. "As he turned to speak to the newcomer the stone beneath him loosened and tilted, and he was precipitated over the edge." Anderson bounced off the roof of an adjoining building, which somewhat broke his fall, before hitting the pavement five floors below. Nevertheless, he was badly mangled. He suffered a broken arm, several broken ribs and numerous other broken bones. His severe scalp wound caused concern that he had also fractured his skull. Still doctors held out hope for "a chance of recovery." Earlier that year the ground floor had become home to the R. Lederer bakery. The animosity between Huner and the Diamond Match Company was in full evidence when Fire Commissioner C. A. Haskell called a meeting of various match company representatives at Fire Headquarters on December 20, 1902. 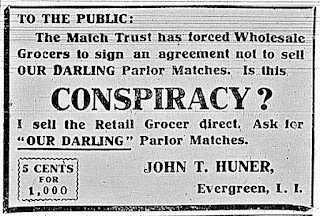 The purpose was to propose regulations on the sale and storage of the "much proscribed parlor match." 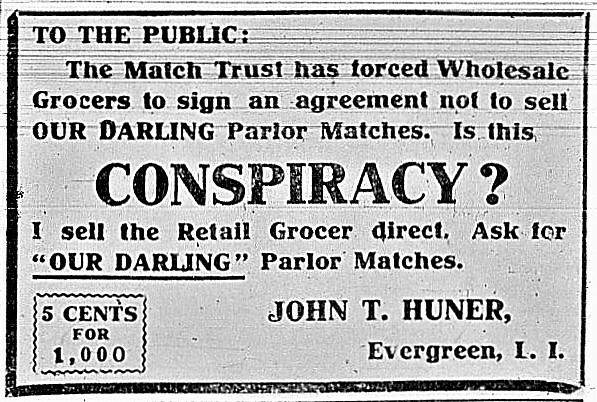 The Evening World reported "the meeting was soon the scene of a wordy battlefield, in which Messrs. J. T. Huner, of the Darling Match Company, and G. H. Hawkins, of the Diamond Match Company, were most conspicuous for their ferocious attacks upon the proposed provisions and upon each other. Each accused the other of violating the agreement regarding the size of the package required, and wound up their hostile demonstrations by shaking their fists in each other's faces." 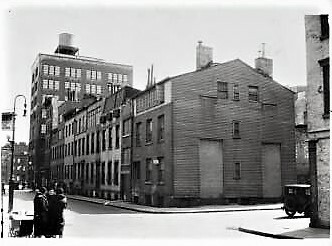 In the first years of the 20th century the shoe district was overtaking the Hudson Street neighborhood. J. T. Huner was replaced at No. 40 by the Bay State Shoe & Leather Co. around 1905. Edwin Wildes Bigelow was the shoe company's president. He moved the operation from Ossining, New York after workers went on strike there. The wealthy manufacturer temporarily lived to at No. 251 West 72nd Street when he relocated the firm. But he soon moved his family into a mansion on Schermerhorn Street in fashionable Brooklyn Heights. He and his wife, Maud, suffered heartbreak when their 15-year old son, Wildes, dies of pneumonia there on January 4, 1907. 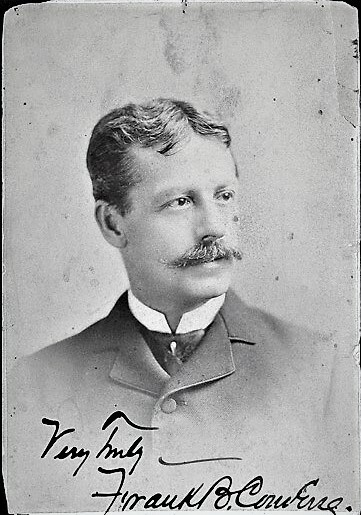 In reporting on his death, the New-York Tribune mentioned "The Bigelow family has been prominent in Brooklyn society for several seasons." The Bay State Shoe & Leather Co. remained in the building at least through 1918. As mid-century neared, the shoe industry had moved on and No. 40 became home to a hodge-podge of offices and light manufacturing. 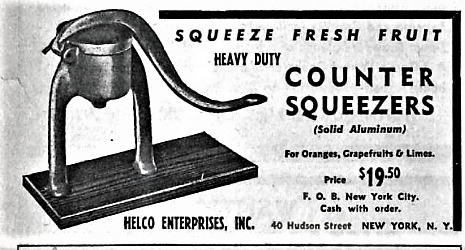 By the mid-1940's commercial equipment firms operated from the building. Among them were Helco Enterprises, Inc.; the Tropical Fruit Drinks Co., which sold equipment like stainless steel fruit drink dispensers and "two pump" soft drink dispensers; and C & K Equipment Co., another equipment supplier to drink concessionaires. For about three decades, beginning in the mid-1960's, the Hudson Electric Sales Co. occupied the ground floor. But industrial electric supplies would give way to toys as the Tribeca neighborhood was rediscovered. In May 1995 Just Jake opened in street level shop. In reporting on the innovative store, Delcie Leimbach wrote in The New York Times, "Designed by Dean/Wolf Architects in New York, it is a toy store with a twist: children are welcome to sample most of the items on sale. there are balls to roll around on, materials for art projects, a stage that beckons young puppeteers and a carpeted 'Book Boat' that is lined with books." Just Jake was still here when the upper floors were converted to residences, one per floor, on 1998. It gave way to a more grown-up store, Tribeca Wine Merchants, around 2004. In 2007 a penthouse, invisible from street level, was added to accommodate a duplex apartment. Despite the woeful modernization that obliterated the decorative panels between each upper floor, the integrity of Edward E. Ashley's design is generally intact. The brick panels on the Commerce Street side are the backs of the fireplaces inside. In the decade following the Revolution the village of Greenwich was still a quiet hamlet, surrounded by farms and country estates. In 1799 Joshua Isaacs began construction of his substantial free-standing home at the corner of the recently opened Bedford and Commerce Streets. 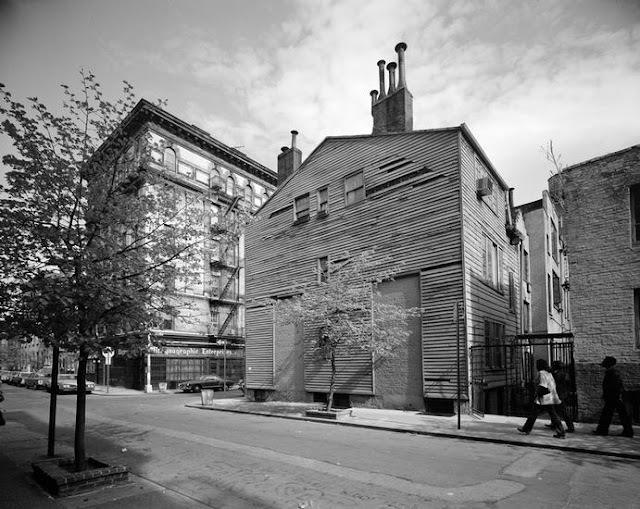 Completed the following year, Isaacs's 25-foot residence was faced in clapboards. The Dutch-style gambrel roof echoed the architecture of a generation earlier. Other elements, like the simple Federal-style doorway, brought the home up to date. Almost immediately Isaacs lost his property in bankruptcy; but it was rescued by his son-in-law, Harmon Hendricks in 1801. Hendricks was called by The New York Times more than a century later, "one of the pioneers in the iron and metal business." The Book of Jewish Lists claims "The first millionaire in America...was Harmon Hendricks, a Sephardic Jew who founded America's first copper rolling mill in the late 1700s." Hendricks and his brother, Solomon, whose office was on South William Street, were the New York agents of Paul Revere. A staunch patriot (newspapers refered to him as having been "in favor of the revolution"), when the Government was in drastic need of metal during the War of 1812, Hendricks teamed with Joshua Isaacs to organize a copper rolling mill in Belleville, New Jersey. It was at the Hendricks plant that the copper boilers for Robert Fulton's steam-powered vessels were made. Hendricks amassed a large amount of real estate, not only including the immediate neighborhood around the house which would be numbered 77 Bedford Street; but the entire block on Greenwich Avenue between Bank and 12th Street; the block of Sixth to Seventh Avenues between 21st and 22nd Streets, and downtown property. Additionally, the family maintained a farm and summer estate in the area that is now around Broadway and 72nd Street. When Hendricks died in 1821 he left an estate estimated, according to The Times decades later, at $3 million--more than 20 times that much in today's dollars. The properties were divided among the six children--Edmund, Harmon W., Joshua, Hettie, Emma and Henry. Among the properties left in trust to daughter Hettie, who was married to Aaron L. Gomez, was the Bedford Street house. Hettie and Aaron, who lived at No. 82 Amity Street (later renamed West Third Street) had six children. Aaron managed the Hendricks properties and by the early 1830's was leasing No. 77 to the Roome family. John P. Roome was listed as a deputy sheriff in 1834 directories, and William Roome as an "agent"--most likely a dry goods or other commission agent. A relative who made his living as a carpenter, Thomas Roome, lived directly across the street. The Roome family were here at least through 1835. City maps that year indicate that the Hendricks-Gomez estate had yet to build on the surrounding property, leaving the house still free standing. It was around the time the Roomes left--about 1836--that Gomez updated the residence with a brick front. No. 77 next became home to the Haff family. John Peter Haff, Jr. was a well-respected attorney. He and his wife, the former Ann Eliza Stillwell, had seven children. So solid was his reputation that Dr. J. Wheeler, "occulist," placed an advertisement for the "superior efficacy of Dr. Wheeler's Treatment of diseased eyes over all others" in November 1839, he listed among his references "John P. Haff, Esq. 77 Bedford st."
Haff's father, who died in 1838, was an inspector of leather, an agricultural expert, and a builder. He was responsible for handsome structures like No. 203 Prince Street. It is unclear how long the Haffs remained on Bedford Street, but by 1852 John P. Haff, Jr. opened the Elm Park Hotel on the Bloomingdale Road. No. 77 had been the scene of a disturbing incident on October 11, 1847. On the opposite corner was the butcher shop of man named Knauer. As he arrived at his store "at a very early hour," according to The New York Herald, he heard a baby's cries. He investigated and "discovered a beautiful new-born female infant, apparently not six hours old, with little or no covering, and exposed almost naked to the cold winds of heaven." Knauer bundled up the infant and rushed back home. In sentimental Victorian prose, the newspaper reported that his wife, "with the feelings of a mother and those of humanity, dressed, provided and cared for it." The Knauers found "a lady who was not blest with an offspring" who willingly took in the baby. The occupants of No. 77 in the early 1860's were Julius and Jane Wist. On January 20, 1863 they welcomed a new baby boy named Diedrich August. Tragically, only four months later, on June 13, the house would be the scene of his funeral. Equally heart-wrenching was the story of the next tenant. John Hemmer was 37 years old and already a widow in 1865. The single father lived here with his 9-year old daughter, Katen. John died on July 13 and his funeral was held in the house the following day. 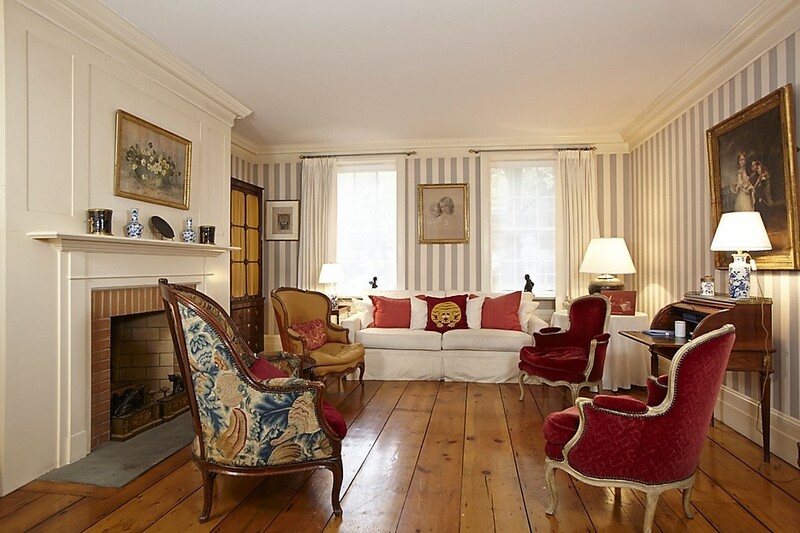 The orphaned Katen was taken in by her maternal grandparents, the Tufts, who lived nearby at No. 35 Morton Street. Three months later, on October 4, the little girl died there. Hetty Hendricks Gomez had died on January 9, that year. The following year Aaron L. Gomez died, and their son, Dr. Horatio Gomez, took over the management of the extended properties. By the early 1870's a family named Rice was living in the Bedford Street house. On May 20, 1873 an advertisement appeared in The New York Herald looking for "A girl about 16 years old, to take care of a child and make herself useful in a small family." Katharine Rice would be the victim of a terrifying incident two years later. The 17-year old was sitting in the parlor at the open window on the morning of September 9, 1875 with two friends. A peach vendor drove his wagon in front of the house and, seeing the girls, asked if they wanted to buy fruit. Katharine agreed and headed to the front door. The New-York Tribune reported "When she went into the hallway to meet him he attempted to commit an atrocious assault upon her, but her screams called her companions, whereupon the ruffian fled." Although the attacker managed to get away, the quick-witted girls had made note of his wagon number and reported it to police. In 1892 Horatio Gomez was 70 years old and had retired from his medical practice. His siblings had become impatient with his kindness which, at least in their estimations, outweighed his business shrewdness. Dr. Gomez had never rendered an accounting of the income and expenses since he took over the administration of the properties in 1866. Now Horatio's brother, Edwin, "demands an accounting and accuses the Doctor of having wasted the property of the reversionaries by leasing some of it for long terms at ridiculously low rentals." Edwin claimed that the rents being charged had not been raised since 1872. On April 10 The Sun explained that the real estate inherited by their mother, "was to remain intact and the children to receive each a sixth of the income from it until all were dead." The value the newspaper put on the lots, which were primarily on Bedford Street, Bank Street and Greenwich Avenue, would be more than $5.5 million today. Despite the family friction, the properties necessarily remained in the Henricks-Gomez estate (as per the terms of the will) as the neighborhood changed from a sleepy residential village to Manhattan's center of art, literature and music. By the first decades of the 20th century the quaint old wooden and brick-faced homes in the neighborhood were being razed for modern apartment houses. In February 1910 the family sold the first of the old Hendrick properties, the entire block front of Greenwich Avenue between Bank and 12th Streets. In reporting on the sale, The New York Times recapped the long history of the Hendricks and Gomez ownership, and mentioned the Commerce-Barrow Street neighborhood specifically. 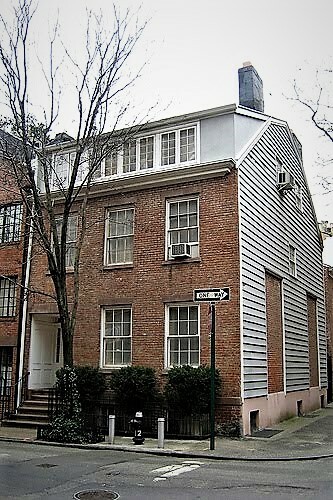 "Most of the houses there retain the old-fashioned characteristics of half a century or more ago, and are interesting survivals of Greenwich Village's more aristocratic residential days." In October 1923 the rest of the properties were liquidated in a single transaction. Spalding Hall and Cyrus Brown, who had recently acquired the nearby houses at Nos. 39 and 41 Commerce Street, bought up Nos. 34 to 44 Commerce Street, and Nos. 73 through 77 Bedford Street. The Times noted "the recently acquired property is being remodeled into studios and apartments." Within a month a group of artists, writers and performers bought many of the houses in an effort to stave off development. On November 18 The Times reported "Greenwich Village has a new community art center. It is in Bedford and Commerce Streets, where the noise of motor traffic on Seventh Avenue never penetrates." The article noted that among the "syndicate" were Pulitzer Prize winning poet Edna St. Vincent Millay who had taken the narrow house at 73½ Barrow and silent film actress Evelyn Vaughn "who has left the Pacific Coast for New York" and had purchased No. 77. The Times described No. 77 as "an old timer, dating back to the early part of the last century. The article noted "This large corner house with its many quaint reminders of simpler New York days is being remodeled, and one of the most important additions will be at least one, and perhaps more baths, for Miss Evelyn Vaughn." Additionally, the actress's architect, Brooklyn-based Ferdinand Savigano, raised the attic roof to create studio space. Bedford Street was widened in 1930, requiring the removal of the old porch with its antique ironwork. The doorway, while preserved, was closed off and the entrance created by Savigano in the rear courtyard became the main access. The house in 1932, shortly after the porch was removed. from the collection of the New York Public Library. The end of the line for No. 77 as a single family home seemed to come in 1938 when it was converted to one apartment in the cellar and two each on the upper floors. Subsequent decades were unkind to the aging wooden structure. Decay and neglect threatened the historic house by the last quarter of the century. But the charm of Greenwich Village's winding streets and vintage architecture drew moneyed families. One by one Federal rowhouses were purchased and restored. The Isaacs-Hendricks house got its turn in 1989 when it was reconverted to a single-family residence by Jacqueline Thion de la Chaume, French socialite and third wife of actor Yul Brynner. Among the renovations was the reopening of the Bedford Street entrance. It was placed on the market in 2013 for a substantial $6.9 million. 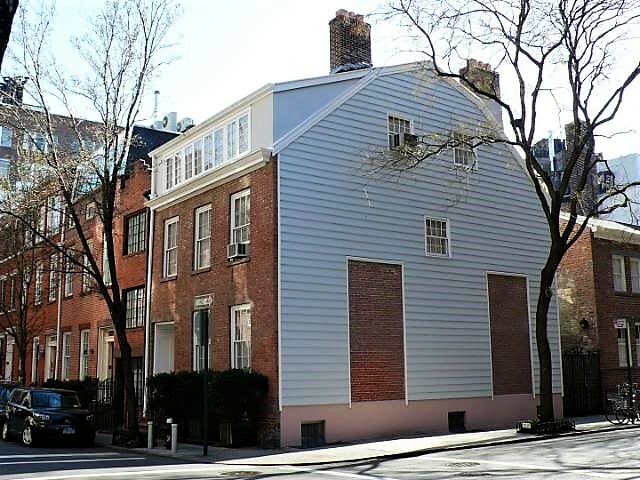 The oldest extant residence in the West Village, the future of the remarkable survivor seems secure. In 1911 the annually-updated encyclopedia Americana noted that "The Sicilian sculptor, Ettore Ximenes" was working on a New York City monument. "It represents Dante, the great Italian poet, and is cost has been met by private subscription among the Italian colony in New York." The report sounded benign eough. But a decade-long furor was about to be unleashed. The project had been initiated by Carlo Barsotti, editor of the Italian-language newspaper Progresso Italo-Americano (better known as Il Progresso). Barsotti was seemingly indefatigable when it came to erecting New York City monuments to his countrymen. He was behind critically maligned statue of Giuseppe Garibaldi in Washington Square, erected in 1888; the Christopher Columbus monument in Columbus Circle four years later; the 1906 monument to composer Giuseppe Verdi in Verdi Square; and the Giovanni da Verrazano, dedicated in 1909. The Verrazano monument had barely been unveiled before Barsotti was at work again. On September 25, 1910 The Sun reported "the Italians of New York, who already have given to the city four monuments to their famous countrymen, are contemplating the erection of a monument to Dante Alighieri." The article said that $8,000 of the estimated $20,000 cost had been received. The proposed monument would stand 50 feet high and include complex marble groupings. Americana explained that it "will consist of an obelisk surmounted by the national star of Italy, and adorned with the Roman eagle in bronze. A life-size statue of Dante stands on the pedestal under the obelisk, supported by two female figures representing Language and Culture, which stand on opposite sides of the coat-of-arms of the City of Florence." Three intricate groupings representing scenes from Dante's Divine Comedy--Inferno, Purgatory and Paradise--would adorn the sides and back. Americana projected "This elaborate work will probably be unveiled in New York City sometime during the summer of 1911." For one thing, Barsotti had forged ahead with the project assuming he would have the blessings of the Mayor, the Parks Commissioners and the Municipal Art Commission. He had also assumed that members of the Italian community, many of them with little cash to spare, would happily continue to fund his unceasing monument building. Both of his assumptions would cause significant problems. On July 30, 1911 The Sun reported "At least part of the Italian community in New York is opposed to giving any more monuments to the city until the community has raised money for a hospital or two or a school or other kind of institution that will uplift some of the crowds of Italians that they are sure need helping in the worst kind of way here now." Additionally, the four other Italian-language newspapers accused Barsotti of seeking "personal glory." An editorial in the Italian Journal said in part "We do not need more monuments. We are constantly hearing in America of the numbers of criminals in the Italian community. We constantly see the number of poor among us. We need to avoid this charge of becoming a burden upon the State and we can't do it by monuments, but by schools and hospitals." Frank l. Frugone, editor of the Bolletinno Della Sera, said "this monument craze was entirely the wrong lead for the Italians in New York...and it is time that it should be stopped." He sent a letter to Mayor William J. Gaynor insisting that the majority of New York Italians were opposed to the Dante memorial and that "there is too much personal and newspaper aggrandizement in the scheme." When newspapers in Rome took up the cause against the memorial, Carlo Barsotti counter-attacked. On January 21, 1912 the Virginia newspaper the Times Dispatch reported he had sued "several Roman newspapers for alleged libelous statements in connection with the erection of the Dante statue." Despite the turmoil, Barsotti ordered the massive monument shipped, fully aware that the City had not provided a site for it. A special cable from Naples on May 11, 1912 to The Sun read: "The Dante monument which is to be erected in one of the New York city parks was shipped to New York to-day on the steamer Moltke." The newspaper added, however, that the memorial "has been the cause of much dissatisfaction among a large part of the Italian population in New York" and that "Commissioner Stover has refused to grant a site for the Dante monument until he sees the statue." The Dante memorial arrived in Hoboken with no place to go. On June 1, 1912 the New-York Tribune ran the headline "Dante In Inferno Here / Poet's Statue Ingloriously Scattered About Piers." Parks Commissioner Charles B. Stover refused to grant a site, saying "I have not been convinced that the Italians as a whole want this monument. In fact, the Italian government will not participate in its erection in any way, and when you come to think that Dante was the greatest Italian of all items, and the government does not care to take part in the unveiling of a monument to him, it is best to consider the reasons why." Things only got worse when, on July 3, 1912, the Municipal Art Commission announced that the monument "had been rejected because of its architectural defects." It was not Ximenes's bronze figure that offended the committee (which included esteemed artist Robert W. De Forest and sculptors John Quincy Adams Ward and Carl Bitter), but his overblown marble base. The Sun reported "No reflection was made upon the Dante statue, but it was said that the assembling of statue, pedestal, shaft and the architectural work generally was not acceptable." Undaunted, the monument's supporters tossed ideas around for highly visible sites. The New-York Tribune included among them, "Bryant Park, the Mall in Central Park, the 59th street and Fifth avenue plaza and Long Acre Square [later renamed Times Square]." Four months later the 232 crates still gathered dust and storage fees in New Jersey. Sculptor Ettore Ximenes arrived in New York to fix things. The New-York Tribune reported on September 22, 1912, "The sculptor has brought with him from Europe a plaster model of the monument and this, he declared, would give the commission a far better idea than did the photographs." Ximenes declared the split among New York Italians over the monument "deplorable" and said that not only the Italians, "but all persons, should be as one in the rearing of a monument to Dante." Despite the sculptor's optimism that he could clear up the conflict, the project remained stalled. The Municpal Arts Commission insisted that he simplify the base. (The Sun ran a sub-headline saying "Figure Declared Unfit for Polite Park Society Unless Revised.") Ximenes did not agree. The Sun seemed to delight in reporting on April 6, 1913, "Dante in marble has been reposing on a pier of the Hamburg-American Line in the barbaric town of Hoboken, judged from the standard of the sculptor of the unhappy Italian poet, for one fretful year." The article reported that the Hamburg Pier had lost patience and insisted that the crates on its several piers be moved. They were brought to Manhattan and put in storage "in the Ninety-seventh street yards in Central Park," according to The Washington Times, which added "Things are, indeed, breaking badly for Dante. And from all indications there is no telling when they will do otherwise." Although Ximenes finally conceded to rework his plans as demanded by the Municipal Art Commission; Former Parks Commissioner Stover was still adamant that the monument would never be erected. The Washington Times wrote "'Let the plans come,' he said. 'There are fully 10,000 Italians who do not want that monument erected in New York. We are waiting for Mr. Barsotti to try to erect it. Then we will go to Mayor Mitchel, to the Art Commission and park commissioner to have it stopped." And, sure enough, the monument was stopped. The crates sat forgotten by almost everyone but Carlo Barsotti and Ettore Ximenes. 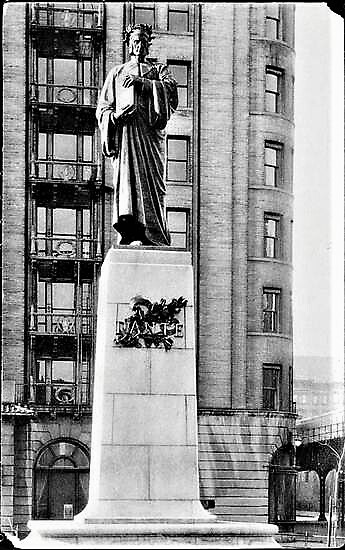 Then, on February 20, 1921, nearly a decade after the monument arrived in America, The New York Herald reported that in a meeting in Rome, that city's mayor, Luigi Rava, and Ettore Ximenes had "urged the raising of a Dante monument in New York" and said "It was suggested that the present year would be suitable for the occasion as it is the six hundredth anniversary of Dante's death." The City, seemingly begrudgingly, agreed. But the over-zealous marble base was still deemed unacceptable. The architectural firm of Warren & Wetmore was commissioned to design a simple stone pedestal. The sole survivor from Ximenes's base design would be a single bronze garland announcing the poet's name. The unveiling took place on November 5, 1921 in the little triangle called Empire Park at 63rd Street and Broadway. It was an anti-climatic victory, largely ignored by newspapers. There were no prominent articles on the ceremonies. Two weeks later, on November 29, The Committee on Public Thoroughfares resolved to change the name of the site to Dante Park. Incidentally, Carlo Barsotti got revenge of sorts when he personally presented a second, identical casting of the statue to Washington DC on December 1 (it, too, had a simple stone base). That ceremony was attended by President and Mrs. Harding. Ettore Ximenes's marble sculptures remained crated and forgotten in the Central Park storeyard until, as described by The New York Times, they were "rescued from twenty years of oblivion." The statues of angels and mortals were discovered by W. Earle Andrews, general superintendent of the Parks Department in 1934 "under a pile of scrap iron in the Ninety-seventh Street storeyard." The statuary was resurrected and lined up in Central Park awaiting placement in various parks and playgrounds. Then in the spring of the following year vandals attacked. On March 21, 1935 The New York Times reported "Nine figures had been beheaded, and their heads lay yesterday in a neat row which also included parts of arms, broken wings, and anything, in fact, that had protruded sufficiently to be broken off." While the president of the Art Commission, I. N. Phelps Stokes, lamented the vandalism, saying the sculpture was "a good piece of work by a capable artist;" Karl Gruppe, chief sculptor of the WPA's Monument Restoration Project, added to the insults of 1912. The Times reported "He said it was of 'poor design' and should have been condemned and destroyed anyway. In his opinion the work of the vandals merely had saved the Park Department some trouble and perhaps controversy." The disgrace and controversy of Ettore Ximenes's noble (if somewhat sinister appearing) bronze figure of Dante faded. In 1992 it was conserved and restored by the Radisson Empire Hotel; and again refurbished by the City Parks Foundation Monuments Conservation Program in 2001. In 1780 brothers Samuel, Matthias and Henry Nicoll sold the land around the present Madison Square Garden to Casplar Samler for $2,250. Little by little he added to the farm until by 1799 he had acquired a triangular shaped holding of about 37 acres at a total outlay of $12,100 (just under $250,000 today). There were three houses on the Samler farm; but it appears Caspar's large family (he had seven children and a step-daughter) lived in the two-story clapboard home that faced the Bloomingdale Road (now Broadway) at what would become 29th Street. Caspar Samler died in 1810, just a year before the Commissioners' Plan dissected Manhattan's farms and estates into a grid of streets and avenues. That grid was merely on paper for now; but the upward movement of the city was not far behind. In the 1830's the cottage was home to Nicholas Samler and his wife, the former Jane Ogden Mansfield. Jane was the daughter of Captain John Mansfield, a British naval officer. The couple's daughter, Mary, was born in the house in 1838. Mary would marry Robert Vernon Davis in 1854. They had four children, Genevieve, Vernon, George and Robert, Jr. The three boys would have illustrious careers. Vernon M. Davis became a New York Supreme Court Justice; Dr. George Samler Davis was president of the Normal College; and Robert Vernon Davis, Jr. was curator of the City College. Around the time of Mary's and Robert's marriage George W. Sumner and his wife, also named Mary, lived in the homestead. George, described as a "merchant," suffered embarrassment in February 1843 when he declared bankruptcy. But he headed in a new direction and became an attorney before 1854. By then development around the farmhouse was increasingly apparent. In 1851 the cornerstone for the stately Marble Collegiate Church directly behind the house on Fifth Avenue was laid; around the same time the Samlers leased half of their Broadway blockfront. The Central Stables was erected on that lot. George left to fight in the Civil War by 1862, when he was "acting master" of the steam gunboat Owasca. Left alone, Mary added to the household funds by renting rooms. An advertisement in The New York Herald on April 13, 1862 read "Mrs. Mary B. Sumner...can now offer the choice of several Suits and single Rooms to persons desiring to make arrangements for Board for the ensuing year or transiently." Because the house sat on what was now determined to be three building lots, the property took the triple address of 1188, 1190 and 1192 Broadway. On March 23, 1863 Congress passed the Enrollment Act, setting the stage for the unfair and highly unpopular draft. Apparently to augment to her income, Mary leased a room to the Government as Provost-Marshal Manierre's office. It was here, on July 8, 1863 that the first draft lottery was held. Mary's decision turned out to be a bad one. On July 13 three days of bloody rioting broke out, known as the Draft Riots. Buildings were burned, innocent civilians murdered, and houses and shops looted. Police Superintendent Kennedy realized that July 13 was a scheduled draft day. The New York Times reported "His first thought...was for the safety of Provost-Marshall Manierre's office, No. 1,190 Broadway." He sent a detachment of officers to the Samler house. But the mobs were greater than the police force. While the house itself miraculously survived, it was ransacked. On August 30, 1863 The New York Herald reported "Mrs. Mary B. Sumner has filed a bill with the Comptroller's clerk, claiming damages to the extend of $56,563.90 for the loss of personal property during the late riots. The claimant kept a boarding house at Nos. 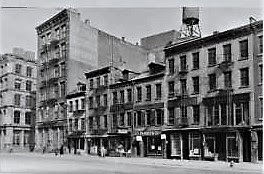 1,188, 1,190 and 1,192 Broadway, and during the disturbances caused by enforcement of the draft in the Eighth district, lost her whole stock of furniture, clothing, bedding, &c." Mary's substantial claim would amount to more than $1 million today. George W. Sumner would not return home from the war. 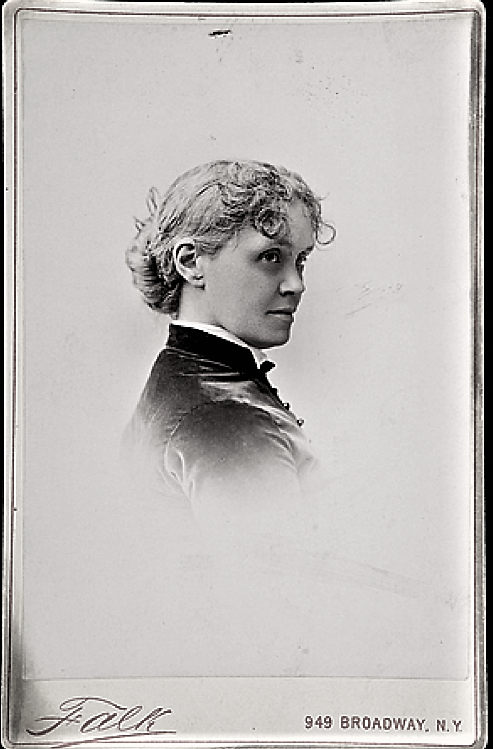 And tragically The New York Times reported on Thursday, March 17, 1865 that on the previous morning Mary Porter Sumner, "only daughter of the late George W. and Mary B. Sumner," had died. Mary left the house before long, apparently leasing it to James Anderson. Who he was or what he did for a living is a mystery; but his time here gave the wooden house its nickname "Anderson Cottage." He was seemingly still renting the property when it drew the attention of Danish-born merchant Peter Gilsey in 1868. 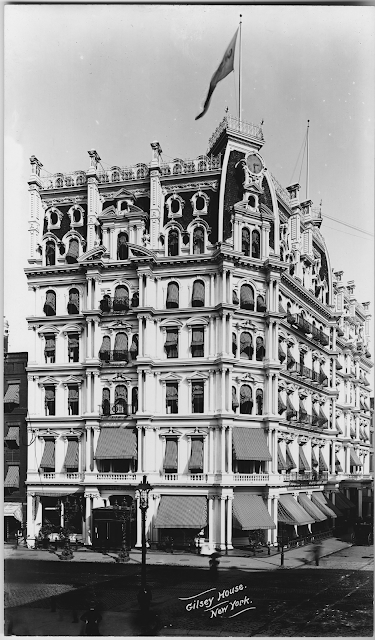 Gilsey leased the corner from the Samler estate and demolished the venerable relic of rural Midtown for his magnificent Gilsey House hotel, which survives. In 1869 developers R. & J. Cunningham completed a row of five brownstone-fronted houses on the south side of East 70th Street, between Park and Lexington Avenues. Designed by prolific architect John Sexton, they were architecturally up-to-date with stylish mansard roofs perched atop the otherwise Italianate-style homes. The purchasers of the western-most house, No. 128, were a young family. Soon after they moved in, on October 6, 1869, an advertisement appeared in The New York Herald seeking "A nurse to take care of two children and to do light chamberwork; must understand sewing and bring city reference." By the late 1870's the house was owned by Hiram D. Peet and his wife, Caroline. It is unclear whether they ever lived here; but by 1878 they were leasing the property to Marcus Otterbourg and his family. Otterbourg was a colorful and often controversial figure in American and New York City history. Following the end of the Civil War the Government had turned its attention to the uprising against Emperor Maximilian I of Mexico. Secretary of State William Henry Seward sent Otterbourg to Mexico in April 1866 as interim charge' d' affaires to the administration of President Benito Juarez. In his 1914 book Maximilian in Mexico historian Percy Falcke Martin credited Otterbourg with saving the lives of many political prisoners. "Mr. Marcus Otterbourg was occupied almost entirely in conducting negotiations with the Mexican government either for the release or the betterment in treatment of the many captives in their hands," he said in part. Not everyone was so impressed with Otterbourg. The New York Herald was unapologetically biased in its political reporting and for years had slammed Otterbourgh. It commented on his hopes to be appointed a police magistrate on June 21, 1873 saying simply, "There is not a vestige of a chance for Marcus Otterbourg." But, in fact, by the time the Otterbourg family moved into No. 128 he had been a judge in the police court for years. The couple had three sons and a daughter. There was quite a bit of excitement on the night of December 2, 1878. Mrs. Otterbourg's brother, Peter Hilger, had come from Philadelphia for a visit. Following dinner he and Marcus went to the library on the second floor and Mrs. Otterbourg retired to the front parlor. Two of the Otterbourg young adult children went for a walk. As Eugene Otterbourg and his sister turned from Park Avenue onto 70th Street, two men ran past them. They were immediately followed by "a man wearing slippers, an alpacca [sic] duster, and spectacles, without his hat, much out of breath, and running with all his speed," as described by The New York Times. That man, they quickly realized, was their father. Eugene dropped his sister's hand and took up the flight. He chased the men to Third Avenue and 73rd Street before they were lost in the crowd. He returned home still not knowing why he had been chasing the them. He discovered that his mother had checked on a noise she heard in the hall and discovered two men were removing overcoats from the coatrack. Alerted by her screams, Otterbourg ran down the stairs in his slippers and out the door in pursuit of the thieves who made off with Hilger's and George Otterbourg's overcoats. A lamp was used to search the streets for the overcoats. Only George's was found. The Times reported, "George is a young man, still at his collegiate studies, and he was much displeased when his overcoat was returned to him. He had worn it some time, and he remarked, when Eugene handed it back to him, that if the thief had only retained it, his father would have been compelled to buy him the new one he had been pleading for all the Fall." The newspaper added "The Justice caught a severe cold from his race in slippers." The Otterbourgs remained in house at least through 1884; but they were most likely still here in 1887 when Caroline and Hiram Peet transferred title to No. 128 to their daughter, Carrie, as "a gift." By 1899 Dr. Max Rosenberg was her tenant. He was Assistant Physician in the Mt. Sinai Hospital Dispensary and an Instructor in Medicine at the New York Post-Graduate Medical School and Hospital. He remained here until Carrie Peet sold the house to Mary T. Spencer in May of 1903. Mary would not retain ownership for long. In September 1904 she advertised the 20-foot wide house for sale, interestingly noting it "will be put in perfect order." On September 16, 1905 the Real Estate Record & Builders' Guide reported that Mary T. Spencer had sold the house, adding "The buyer has given A. Busselle, architect, an order to remodel the house into an American basement." Two months later there was a change in architects. On December 16 the Record & Guide reported that Clement B. Brun would be doing the $15,000 in renovations for T. J. McLoughlin. The extensive remodeling included a four-story extension to the rear, a "new front," and reconfigured interior walls. Brun transformed the out of date brownstone into a modern neo-Georgian style home. With the stoop removed, the front wall was pulled to the property line. Three stories of red brick sat upon a rusticated stone base where the double-doored entrance sat within a molded frame. Tall casement windows at the second floor imitated French doors and were fronted by pseudo balconies. Above the bracketed stone cornice the mansard featured two pedimented dormers. McLoughlin sold the completed house in 1907 to William Edward Schenck Griswold and his wife, the former Evelyn Sloane. The had been married in Lenox, Massachusetts early in September that year. Following their honeymoon trip, The Sun reported "Mr. and Mrs. William E. S. Griswold are now in their new home, 128 East Seventieth street," on January 5, 1908. The Griswolds were socially prominent. William was related to the Webb and Burden families, and Evelyn was the daughter of John W. Sloane, partner in W & J. Sloane, Inc. Her uncle William was married to Emily Vanderbilt. Not coincidentally, Griswold would eventually become president of W. & J. Sloane. The couple summered in the Griswold country estate, Black Hall, in Old Lyme, Connecticut. Evelyn would eventually inherit her father's estate, Wyndhurst, in Lenox, as well. They returned to No. 128 every winter season through 1914. Then on March 28, 1914 The Record & Guide reported they had leased the house for three years to banker Louis Morris Starr. But, in fact, they would never return. The Starrs purchased the house in February 1919. Louis was the son of Theodore B. Starr, one of the preeminent jewelers of the 19th and early 20th centuries. In 1898 he had married Emeline Jenkins Danford. The couple had three daughters, Caroline Margaret (who went by her middle name), Beatrice and Emeline. The family maintained a country estate, Ontaroga Farm, in Ridgefield, Connecticut. The Starr family traced its American roots to Dr. 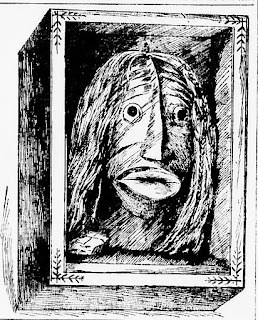 Comfort Starr who arrived in Massachusetts in 1634. Louis's career in banking most likely came as a surprise not only to his family but to society in general. Until 1908 he had been president of his father's firm, Theodore B. Starr, and he was nationally-recognized as an expert in gems. But that year he sold his interest in the company and turned to finance. The same year the Starrs purchased No. 128 Emeline introduced Margaret and Beatrice to society. The girls were born in 1899 and 1901, respectively. The debutante events began with a reception in the house on December 13. In the evening Emeline took the group of young women to the theater, then to the Crystal Room of the Ritz-Carlton "for dancing." The first of the daughters to lave East 70th Street was Beatrice, whose engagement to William de Ford Beal of Boston as announced in July 1922. The wedding (deemed by the New-York Tribune as "prominent") took place in the Central Presbyterian Church on Madison Avenue. 1927 was a remarkable year in the Starr household. The house was the scene of Caroline Margaret's wedding to Theodore Carrington Jessup on the afternoon of March 24. Her sister, Emeline, was her maid of honor. Just three months later, on June 4, the Starrs announced Emeline's engagement to John Hampton Lynch, Jr. Her wedding took place in St. Stephen's Episcopal Church in Ridgefield, with a reception at Ontaroga Farm. Louis and Emeline remained at No. 128 East 70th Street until his death in February 1936. In July 1943 it was sold to Coulton Waugh and his equally well-known wife, Elizabeth Jenkinson Waugh. The multi-talented Waugh was an artist, cartoonist, teacher, textile designer and author. His cartoon illustrations included Milton Caniff's "Dickie Dare," "Terry and the Pirates," and "Hank" (his own comic strip). He wrote a series of instructional texts on painting and other books. Elizabeth was also an artist as well as an authority on hooked rugs and the author of Collecting Hook Rugs. She also wrote the biography Simon Bolivar and the 1943 West Point. The couple's country home, Green Pastures Farm, was in Newburgh, New York. It was there, on March 20, 1944 that Evelyn died. Five years after her death the house was converted to apartments, two per floor. Its most celebrated tenant would be American novelist John Kennedy Toole, who shared the fourth floor apartment beginning in the spring of 1960 with friend Kent Taliaferro. Toole's best known novel, A Confederacy of Dunces, would not be published until 1980, eleven years after his suicide. Outwardly little has changed today to the prim neo-Georgian house more than a century after its make-over. The appearance of the upper portion of No. 325 in 1819 would have been similar to the houses on either side. Canal Street got its name from the eight-foot wide drainage canal (perhaps better described as a trench) that ran down its center. Construction on the canal had begun in 1805 and was completed in 1811. The conduit came with problems. The slow-moving water smelled and was a breeding ground for mosquitoes. As development encroached within just a few years it became obvious that something had to be done. In 1819 the canal was covered over, creating an especially broad 100-foot wide roadway. Immediately construction of brick-faced homes began, among the very first being that of John Dyer, completed prior to 1820. At three and a half stories tall and three bays wide, it was a commodious residence. A single dormer most likely poked through the peaked roof of the Federal-style edifice. In 1860 Canal Street was renumbered, giving the former Dyer house the address of No. 325. By then the encroachment of commerce had arrived and the former private homes were converted for businesses. In 1862 No. 325 was home to J. Cook's fancy goods store at street level and his hat-making shop above. A want ad on September 17 sought: "Ladies' Dress Caps--Wanted experienced hands to make ladies' dress caps. Apply to J. Cook, wholesale and retail dealer in ladies' dress caps, laces, ribbons, &c."
Within the decade Charles J. Brill was making hats in an upstairs space. He was almost assuredly related to Samuel Brill, who ran his dry goods store next door at No. 327. Charles was looking for a "first class milliner" in 1873. In the meantime, the ground floor had been home to a French restaurant for several years. But conflict between its owners took them to the breaking point in the spring of 1872. An advertisement in The New York Herald on May 7 offered "A good French restaurant for sale--In a good street down town; a good bargain for a man who understands the business; reason for selling dissatisfaction in partnership. Inquire of Mr. Zaebson, 325 Canal street." $800 reward--For restoring the whole of the Furs stolen from my stone on the night of December 1 and no questions asked; for any part of the goods returned I will give the reward in proportion to the above. The value of the lost stock was evidenced in the sizable reward, more than $16,500 by today's standards. It may have been the calamitous Financial Panic of 1873 that resulted in the entire upper portion of the building being vacant in 1875. The owner advertised "Second and Third Lofts--Cheap rent to a reliable party" on September 12. Within the year E. A. Bracket "jobber and millinery goods" was leasing space. In 1877 the aging structure was renovated to create a modern commercial structure. A cast iron storefront was installed and the roof raised to a full floor. The investment proved successful and the building soon filled with garment manufacturers. As the century drew to a close Bernheim & Co., shirtmakers, had a sizable operation. It employed 35 men, 15 women and 7 girls under 21 years old. The staff worked 59 hours per week, not including weekend hours. 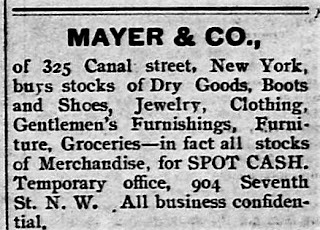 Also in the building was Mayer & Co. which bought and sold overages, the stock of bankrupt or burned out businesses, and similar goods. 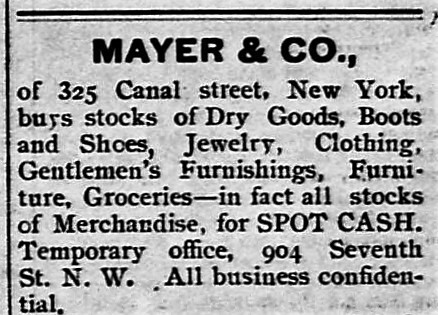 Mayer & Co. remained in the building until its own bankruptcy in October 1907. Glick & Lodner was in the building at the time, dealers in "cloths, cassimeres, etc." But change was on the very near horizon. By the end of World War I No. 325 was home to Thomas J. Ivans's business. A "building contractor, plumber, steam and gas fitter," Ivans had been in the business for decades by now. On September 1, 1918 The Plumbers' Trade Journal thinly veiled its disdain of the union movement in reporting on Ivans's innovative hiring policies. The article said that Ivans had formerly contacted that magazine to find skilled workers. "That was before the day of the trade unions. Mr. Ivans meets the shortage of competent helpers by a sort of selective draft, and he gets good results, too." T. J. Ivans, which would remain in the building into the 1920's, was a pioneer in the changing personality of Canal Street. By mid-century the street was filling with plastics and electronics businesses. In 1949 Pocket Radio Craft was in No. 325, advertising in Popular Science magazine for its "3 Tube pocket radio kit." Amateur radio buffs who sent in $9.95 would receive a do-it-yourself kit "complete [with] all parts, headphone, batteries, etc." The ad mentioned that instructions were included, as well. Gyro Electronics, Co., was here through the 1950's. It, too, courted the home workbench tinkerers. An article in Popular Science in August 1957 gave its readers step-by-step directions to make "A Speed Alarm You Can Build." The article noted that all the parts were available at Gyro Electronics Co. on Canal Street. Sharing the building at the time was a similar firm, Radionic Products, Co., dealers in radio parts. The Soho-Tribeca renaissance resulted in the resurrection and restoration of some buildings along Canal Street--like the recent make-over of the contemporary Federal-style houses next door at 321 and 323. That good fortune has yet to visit the 200-year old disrespected and graffiti covered 325, however. In the 1840's Caleb O. Terrill was listed in city directories as "mason;" but by the early 1850's he had changed his title to "builder." 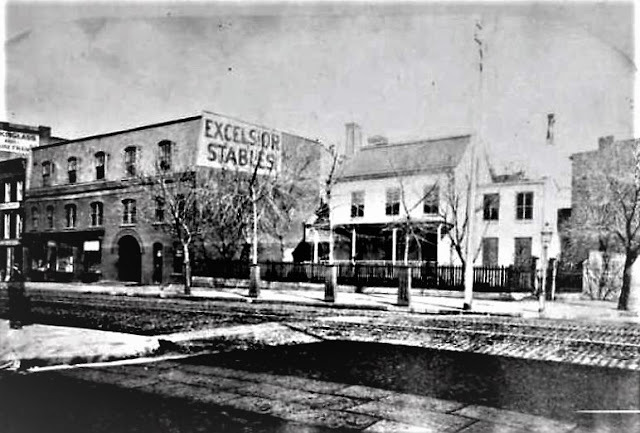 In 1854 he embarked on an ambitious project of erecting three high-end homes at Nos. 330 through 334 West 20th Street, facing the tranquil grounds of the General Theological Seminary. The block, between Ninth and Tenth Avenue, was becoming lined with elegant rowhouses. Terrill's three 16-foot wide dwellings were designed in the Anglo-Italianate style, foregoing the common high stoop in favor of low porches a few steps above the sidewalk. The rusticated brownstone first floors included round-arched openings. The three stories of red brick above were trimmed in brownstone. The common pressed metal cornice included an unusual frieze of bosses protruding through diamond-shaped openings, creating a honeycomb effect. It is possible that Terrill never saw them completed. He died on October 25, 1855, one year after the death of his wife, the former Polly H. Cook, on September 9, 1854. Jonas W. Terrill, acting as administrator of Caleb's estate, oversaw an auction of Nos. 332 and 334 on March 22, 1856. The announcement described them as "two elegant English basement houses...with handsome brown stone basements, superbly built and beautifully finished, with all the improvements of furnace, gas, water closets, baths, &c." The Terrill estate maintained ownership of No. 330. In 1865 20th Street was renumbered, giving the houses the addresses of 446 through 450. No. 446 appears to have been operated as a boarding house at the time. A baffling advertisement appeared in The New York Herald on April 9, 1869 that read "If Mr. Winters, Upholsterer, will call immediately at Mrs. Dickinson's 446 West Twentieth street, he will hear of something to his advantage." By 1872 there was a different family leasing No. 446. They were looking for a servant girl in April that year, to work "as chambermaid and laundress; wages $13." The following year in September when the family had a room available to rent out, they carefully worded their advertisement to avoid possible problems later. Elegantly furnished room, with or without Board, to gentleman and wife or two single gentlemen in a private Jewish family; terms reasonable. The family of William Berri, Sr. lived next door and began leasing rooms at the same time. An ad in The New York Herald on April 22, 1873 offered "Front basement, large parlor, all of Third Floor; one on Fourth, 448 West Twentieth street; all improvements; fine order and locality. $60 month." The rent was substantial, equaling about $1,270 per month today. The Berris' leasing of rooms apparently had more to do with unused space than financial need. William Berri, Sr. was the head of Wm. Berri's Sons, described by the American Carpet and Upholstery Journal as "one of the oldest carpet concerns in the country." William Berri began by manufacturing "oil-cloths" in the 1840's. He opened his first carpet store on Fulton Avenue in Brooklyn on April 1, 1859 and brought his sons, Eugene D. and William, Jr. into the firm in 1870. William Berri died in the house on Sunday evening, July 26, 1874. The 60-year old's funeral was held in the parlor two days later. Interestingly, his widow, Sarah, dabbled in real estate. On September 20, 1884 The American Architect and Building News reported that "Mrs. S. Berri, 448 West Twentieth St., New York," had hired architects J. B. McElfatrick Sons & De Baud to design a three-story tenement on Bedford Avenue in Brooklyn. On December 16, 1887, the title to No. 448 was transferred to the Berri daughters, Cora S., Lilla C, and Julia. Before the month was out it was the scene of a wedding. On December 30 The Evening World reported "Miss Lilla C. Berri was married to Mr. Christian Schuckle, at the home of the bride's mother, Mrs. Sarah E. Berri, of 448 West Twentieth street, last evening." The article mentioned "The floral decorations of the house were on an extensive scale." The Berri family would retain ownership of the house until January 1891, when the sisters sold it to Philip Boyer. That same year Emma Terrill sold No. 446 to James Carlton Cady. Called by The New York Times an "important ice man," Cady was the head of the Glasco Ice Company. Born in Hartland, Vermont in 1846, he and his wife, Annie, had two daughters, Sophrona and Mae, and a son, James, Jr. He had started his career in the ice business in Chelsea at the age of 18 and over the decades watched small family-owned firms get gobbled up one-by-one by large corporations. Cady vehemently refused to sell out, risking his family's financial stability more than once. The family had lived in the house for nearly three decades when The Sun reported on December 5, 1919 "James Carlton Cady, head of the only independent ice manufacturing establishment in the city, who is said to have lost several fortunes in his fight against the larger companies, died in his home at 446 West Twentieth street, yesterday, at the age of 73 years." His funeral was held in the house the following afternoon. In the meantime perhaps the most colorful residents of the row had lived at No. 430. In the 1870's Frank Converse was well known for his minstrel performances. On January 12, 1873 The New York Herald had advertised an "immense attraction this week," saying the San Francisco Minstrels would was in town. The notice mentioned the "First appearance of the wonderful Banjo artist, Mr. Frank Converse" and urged "Don't fail to see him." Called the "Father of the Banjo," Frank Buchanan Converse was born in Elmira, New York in 1837. He did not invent the instrument, but he perfected it. He was married in 1861 to Harriet Maxwell, another Elmira native, and the daughter and granddaughter of Indian traders. The New York Times later said that the two men "had been so liked by the Senecas that they had been adopted by them." They were a happy, if unlikely couple. Harriet wrote poetry and was a personal friend of John G. Whittier. Much of her poetry was written under the pseudonyms of Musidora and Salome. By the time the couple rented rooms at No. 450, she was best known for her affiliation with Native Americans. In 1884 she had been adopted by the Senecas and in 1891 she lobbied tirelessly against the Whipple bill which proposed to force Indians off their reservations. Because of her work she was made a chief of the Six Nations--the only time a white woman was so honored. On September 12, 1897 The Times reported "Mrs. Converse, or Ta-le-wanoh, as she is called by the Indians, is a Seneca Indian chief of the Snipe clan, adopted by this tribe in recognition of her services to the redmen of New York State. Her father, Thomas Maxwell of Elmira, always paid the keenest attention to Indian matters. For many years Mrs. Converse has followed up legislation in their interest, visited with great frequency the reservations in the western part of the State, and kept a watchful eye on the Indians of New York City." The Converse apartment was filled with Native American relics and decorations. 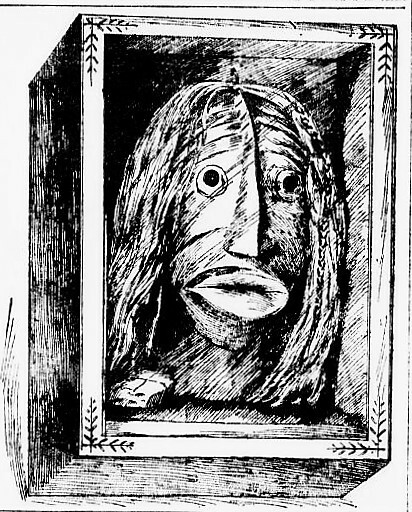 On August 16, 1903 The Sun reported that "The Iroquois Indians of New York State have sent to Mrs. Harriet Maxwell Converse, 450 West Twentieth street, a 'live' or real false face, as a mark of their appreciation of her devotion to them for many years." The mask was said to contain medicinal powers and had to be returned to the reservation once each year when, according to the article, "the leader of the society will wear it at the New Year's feast that it may 'dance with its brothers.'" Were anyone other than the leader or Harriet Converse touch it, "it is liable to poison whoever else may handle it." Two weeks later Frank Converse died suddenly in the 20th Street house. On September 6, 1903 The Sun reported, "His wife, Mrs. Harriet Maxwell Converse, the well-known writer and lecturer on Indian topics, is prostrated, and last night was under medical care." Harriet never recovered from her husband's death. On November 18 she visited "some Indian friends," according to The New York Times, and complained of not feeling well. The newspaper said "Feeling that she had not long to live, she returned home and addressed a package to Joseph Keppler of Puck, in which she surrendered some secret medicine of the Indian order of which she was a member, it being the duty of the members to do so before death." Shortly before midnight one of the women who lived in the house noticed Harriet's door was ajar. She and some of the other women checked and found her unconscious. She died shortly afterward. On November 20 The Times wrote "All day long yesterday Indians in the city went to the house to take a last look at the little room on the top floor, in which she had a part of what was once the most complete collection of Iroquois relics in existence, and where she made it a custom to receive her Indian friends." The Sun reported "It was well known among Mrs. Converse's friends that she wished to have the Indian burial ritual used at her funeral." The article noted that the funeral "would be conducted according to the Indian ritual and that Corn Planter, chief of the Wolf clan of the Senecas and priest of 'Gon-oi-din,' Iroquois religion, would undoubtedly officiate." Harriet's extensive and valuable collection of Native American artifacts were bequeathed to the American Museum of Natural History. While Nos. 448 and 450 continued to be operated as rooming houses past mid-century, No. 446 remained a private home. In the 1980's it was home to author and literary critic Ronald Christ. In the meantime, the other two houses were converted to one apartment per floor--No. 448 in 1963, and No. 450 in 1968. Perhaps the most celebrated resident of No. 450 after the Converses was composer and writer Nicolas Nabokov. He was best known for having composed the music to Don Quixote, the full-length ballet created by George Balanchine for the New York City Ballet in 1965. He died at the age of 75 on April 6, 1978. In the decade after the end of the Civil War the Upper East Side saw rapid development. The opening of the Third Avenue subway line in 1878 and the Second Avenue line the following year made the district more desirable and convenient. And as the population increased so did the need for schools, fire and police stations, and churches. In June 1879 (one month after he dedicated the new St. Patrick's Cathedral) Archbishop John McCloskey approved the organization of a new parish, St. Monica, at the lower hem of the Yorkville neighborhood. Land was acquired on West 79th Street, between First and York Avenues. On September 24, 1881 The Real Estate Record & Builders' Guide reported that the Catholic Church "are going to build a church, to be known as St. Monica's Church." Architects Babcock & McAvoy were preparing plans, the article noted, for a 100-foot wide structure with a seating capacity of 1,800. "The front and basement will be constructed of bluestone, trimmed with granite, and the sides and rear of brick, with stone trimmings." The construction costs were projected at more than $3 million in today's dollars. The Rev. James J. Doughtery was appointed pastor of the fledgling parish. As work began on the church, services were held initially above a 78th Street feed store, then in the chapel of the unfinished structure. As with all new parishes, aggressive fund raising went on to attack the debt of building. 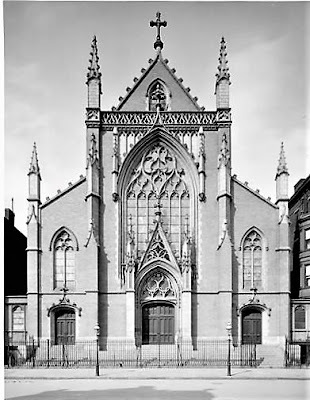 On December 5, 1883 The New York Times noted "The envelope collection in the chapel of the Church of St. Monica, in East Seventy-ninth-street, last Sunday, amounted to $1,500, which, with $7,000 as the proceeds of the late fair, makes $8,500 as the amount contributed by the people of the parish within the last six weeks for the reduction of the church debt." Like most Victorian pastors, Rev. Doughtery had decided opinions about social ills. On Sunday March 14, 1886 he initiated his series of sermons on the "Evils of Modern Societies." The subjects of his seven discourses were Irreverence, Indifference, Irreligion, Education, Home Life, Public Life, and Triumph Over Evil. Churches routinely hosted summer excursions to picnic grounds. The day-long outings gave city-bound children and their parents a break from the stifling heat and daily drudgery. On the morning of May 29, 1900 parishioners of the Church of St. Monica gathered at the 90th Street pier in anticipation of an outing at Idlewild Park, on Long Island. They were most likely more than a bit troubled when they saw furious activity--and a sunken vessel. The evening before the barges Charles Spear and the Susquehanna were being towed to the pier when the Charles Spear hit a rock that gashed an large hole in her hull. Tug boats managed to get the large craft to the pier, where it abruptly sank. The Myers Excursion Barge Company, which owned the crafts, assured the church "The excursion need not be interfered with, as other barges are available." Among the parishioners of St. Monica's Church in 1902 was the family of Policeman Edward Burns. Burns, coincidentally, was the beat cop in the immediate neighborhood. The Evening World called him "big and scrupulously conscientious over the custody of streets in the vicinity of St. Monica's Church." He was also scrupulously conscientious about the sanctity of church property, a fact that became evident on November 13. A few days earlier James Ross had lost his job as an ashcart driver with the City's Street Cleaning Department. The despondent man drank until he was thrown out of a nearby saloon, and then out of a drugstore where he had just purchased rat poison. Ross stumbled to the steps of St. Monica where he swallowed the poison. The Evening World reported that Officer Burns "was dumfounded [sic] early to-day when he discovered the form of a poorly dressed man lying on the steps over which he and his family went to worship last Sunday." Ross told Burns, "I have just committed suicide." Burns was less concerned about saving Ross's life than preserving the sanctity of the church steps. "Rather than have a suicide disgrace the stone steps leading into St. Monica's Catholic church, in Seventy-ninth street," related the newspaper, "Policeman Edward Burns today carried the writhing body of James Ross for half a block before calling an ambulance." The idea of his taking the dope on the church steps. He ought to get six months for that alone. I am going to see that he gets his due, for I think he did it on purpose. Just to think of trying to die in front of a church after being thrown out of a saloon and a drug store! He must have thought the church was easy, but I nabbed him in time. Rather astonishingly, those stone steps led to a still-uncompleted building, 20 years after construction had begun. A temporary wooden structure had made do to date. 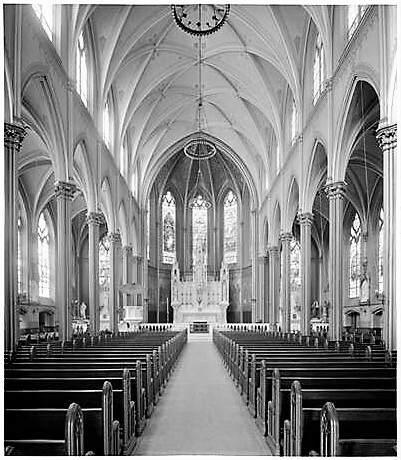 But on March 27, 1904 the New-York Tribune reported that "Plans have been filed...by Schickel & Ditmars, architects, for the completion of the church building of St. Monica's Roman Catholic Church, in East Seventy-ninth-st...The basement only of the building is at present finished." The Record & Guide announced that the plans included "stone and brick, slate roofing, nickel-plated plumbing, electric wiring, organ and steam" at a cost of $70,000. 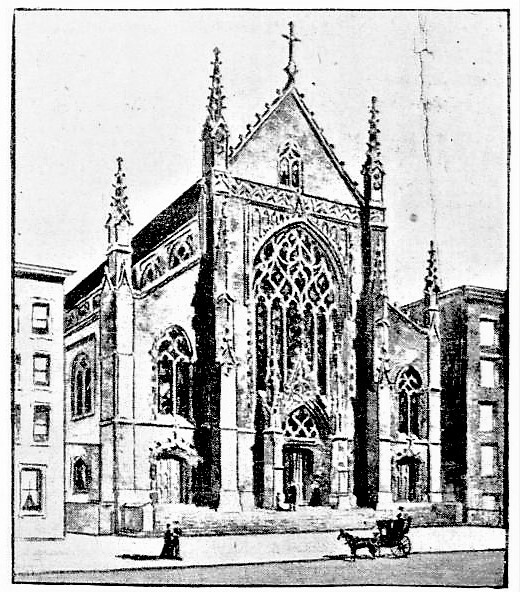 Because the structure would be placed atop the Babcock & McAvoy chapel and basement, the plans were filed under "Alterations" rather than "Projected Buildings." The New-York Tribune reported that the building would be "of decorative Gothic design." And indeed it would be. The architects had designed an English Gothic structure of beige brick and stone. Schickel & Ditmars forewent a towering steeple in favor of four stone spires sprouting Gothic crockets. A massive central stained glass window dominated the design, overwhelming even the handsome, projecting stone entrance directly below. A year later, on May 8, 1905, the New-York Tribune reported "With all the pomp and ceremony of the ritual of the Roman Catholic Church the cornerstone of the new Church of St. Monica, 79th-st., near 1st-ave., was laid yesterday afternoon in the presence of an immense throng. The new church is being built around and above the edifice in which the people have been worshipping." By now, according to the article, construction costs had double, now estimated at $150,000 (about $4.3 million today). The Tribune predicted "It is expected to have the church completed this fall." On November 29, 1908 the newspaper reported on the dedication of the structure. While it called the ceremonies "elaborate," the article was more focused on the size and beauty of the building. It said "The new church is among the largest Catholic churches in the city" and its "spacious and adorned interior make the church one of the most complete and ornate to be found in the country. It is familiarly spoken of as the East Side Cathedral." The article placed the seating capacity at 1,300 on the main floor and noted "the main alter is forty feet high and made of Carara marble, as are also the side alters and the statues." On the afternoon of February 14, 1911 two thieves picked the wrong church to rob. At around 5:30 Sexton Hugh P. Connolly entered to discover Raffale Fantano and Cheli Guilio tampering with the poor box. The New York Times reported "He rushed at them, shouting for help, and grappled with Guilio." Father William Jordan rushed in to handle Fantano. Father Jordan told police later "I got within five yards of my man before he saw me and when he did so I lost no time, as I did not know what weapons he carried. I smashed him in the left eye and got him by the throat. He is a strong fellow and he threw me, but we rolled over and he swore loudly in Italian as I pummeled him." Pummeled him, he did. The Times recounted "Father Jordan used up his man so completely that he needed the attention of an ambulance surgeon before he could be taken from the East Eighty-eighth Street Station to Police Headquarters." Father Jordan and Sexton Connolly dragged the men to the police station themselves, no doubt astonishing the cops on duty there. The crooks had managed to pull $3.35 from the poor box, and it was not their first visit. "The church, according to Father Jordan, has suffered for a long time from poor-box thefts, but not until last night was the problem of the money's disappearance solve," reported the newspaper. Two months later the incident was largely forgotten as the church prepared for a yearly fund-raising event that would surely raise eyebrows today. On April 26 The Evening World reported that "Preparations for the annual minstrel show of St. Monica's Roman Catholic Church...are complete. Yorkville is on edge, for this is the banner entertainment of the year in that part of the city." The article said that a "chorus of ninety girls and half as many young men" would perform. It added "The proceeds will be devoted to lifting the debt incurred when the Rev. Father Lennon in 1907 raised St. Monica's from n old type wooden structure to a big modern church." Ticket buyers could look forward to Miss Edna Schaufele singing "How Can They Tell I'm Irish?" accompanied by eight dancing girls. In addition, said The Evening World, "'Implicitus' Joe Farley, the veteran interlocutor, and 'Dinklepop' Peter Buckley will be on the job." The onslaught of the Great Depression seriously affected Yorkville residents and, subsequently, the Church of St. Monica. Its pastor since 1913, Father Arthur J. Kenny had been elevated to Monsignor in 1926. He watched his congregation decline to 3,900 by 1942, about 30% fewer than in the 1920's. Monsignor Kenny turned the focus of the church's outreach to serving the unemployed and needy. Three decades after taking the pulpit here, Monsignor Kenny died in April 1943. The Times called him "A quiet and retiring man who sunned publicity." Dwindling membership did not prevent the church from being crowded with 1,200 mourners on April 24, the day of his funeral. The services were led by Auxiliary Bishop Stephen J. Donahue and attended by another Auxiliary Bishop, J. Francis A. McIntyre, two monsignors and 50 priests and seminarians. With the 75th Anniversary of the founding of the parish just months away, fire broke out in the church in August 1953. The four-alarm blaze resulted in significant damage "necessitating considerable renovation," as noted by The Times. Donations poured in to restore the structure and seven months later, on March 8, 1954, The New York Times reported that the goal of $125,000 had been surpassed by $66,000 with money still coming in. On October 25, the same newspaper reported that Cardinal Francis Spellman had celebrated the jubilee mass in the renovated church. "There was a capacity congregation of 1,800." Change in the demographics of Yorkville and times in general were reflected in the parishioners and the activities of the Church of St. Monica over the subsequent decades. On October 16, 1980, for instance, it was the scene of an event hosted by the Irish Arts Center. It featured "traditional music and dance--jigs, flings, reels, and mazurkas." The Times added "Special instruction in Irish ceili dancing will be offered." As Catholic Church attendance in general lessened and income subsequently suffered, the Archdiocese looked at closing parishes throughout the city. In November 2014 Cardinal Timothy Dolan announced the closing of the Church of St. Elizabeth of Hungary, the church for the city's deaf Catholics, on East 83rd Street. Its congregation, as well as that of St. Stephen of Hungary, were merged with St. Monica. The action resulted in the somewhat cumbersome name of The church of St. Monica-St. Elizabeth of Hungary-St. Stephen of Hungary. Sadly, Schickel & Ditmars's striking English Gothic structure, once referred to as the Cathedral of the East Side, is often overlooked today.